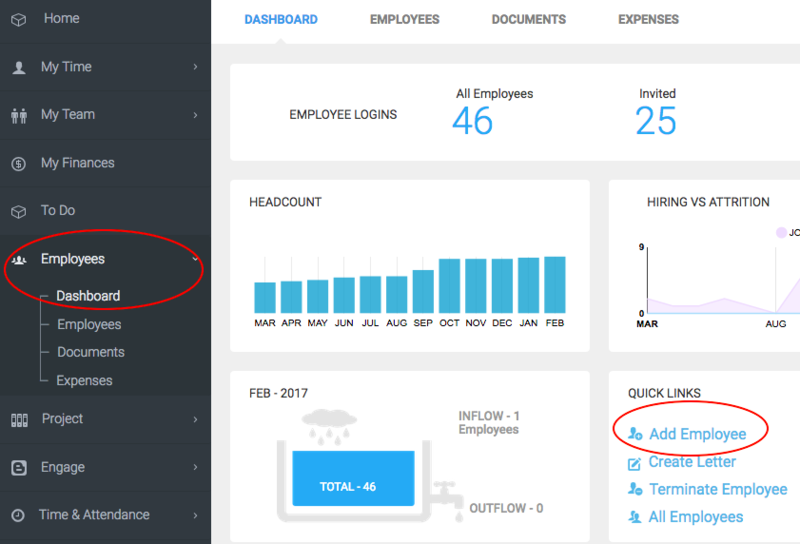 How do I update employees Profile & Job information in bulk? Though it is recommended that all employees Profile(*) & Job(#) informations are updated on Keka soon after the completion of initial setup, there can be times when these information might require a change or update. Step 3: Open the Excel file that you just downloaded. You will find columns for each profile information data against each employee. Update any data that might require change/updation. Once done with updating the information, save this file. IMPORTANT: Email addresses CANNOT be updated in bulk using Excel file. Step 4: Once you are done with saving the updated file, go back to the previous screen and click on the ‘Upload Excel File’ button and choose the file you just saved for upload. 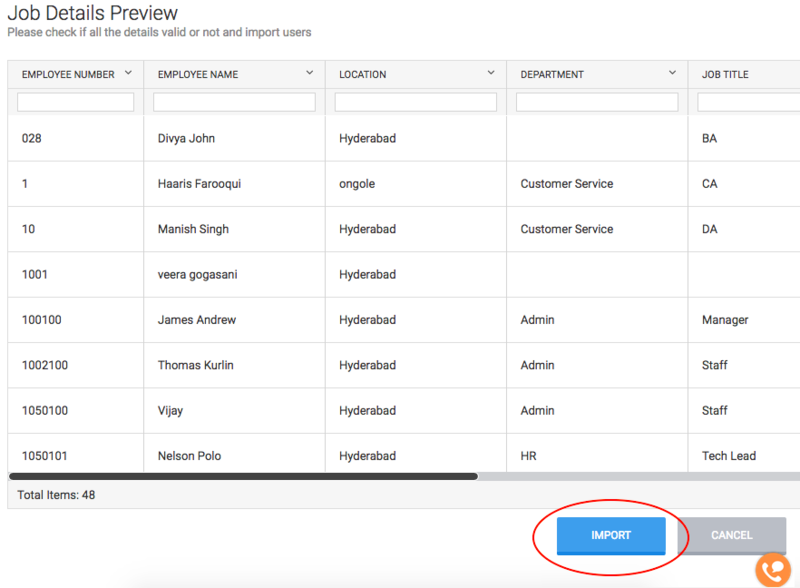 Step 5: On next screen, system will give you an option to match ‘Email address’ of employees for updating all respective other data. Choose this Radio button and click on ‘Continue’. Step 6: Once done with uploading, you will be asked to review the information. 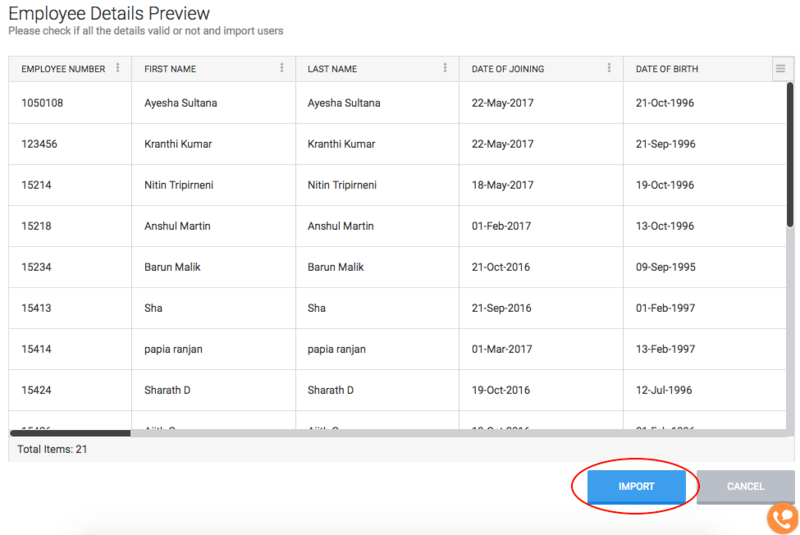 Once you have verified the correctness of data being imported, click on ‘Import’ on the next screen to import the data. Step 7: Once the data is imported, you will see a confirmation screen, click on ‘Complete’. This will update all the required profile information of employees. Step 3: Open the Excel file that you just downloaded. You will find columns for each job information data against each employee. Update any data that might require change/updation. Once done with updating the information, save this file. Step 4: Once you are done with saving the updated file, go back to the previous screen and click on the ‘Upload Excel File’ button. Step 5: Once done with uploading, you will be asked to review the information. Once you have verified the correctness of data being imported, click on ‘Import’ on the next screen to import the data. Step 6: Once the data is imported, you will see a confirmation screen, click on ‘Complete’. This will update all the required job information of employees. In case you are not able to update profile or job information of your employees, write to support@keka.com. What roles can user have on Keka and what permissions do they have? As a good practice, organisations define responsibilities of their employees and respectively assign roles to them. Few common examples of roles in an organisation are – HR Manager, HR Executive, Payroll Admin, Asset Manager etc. With each role, come different responsibilities. Having multiple roles defined in an organisation also helps enhance performance of employees, since employees know exactly what is expected from them. Keka has 6 pre-defined roles that can be assigned to the employees. Each role has restrictions to modules that can be accessed. Global Admin – A ‘Global Admin’ role has all permissions across the Organisation’s Keka system. They can view and make changes to almost everything related to their organisation’s information on Keka, including finances. Usually CXOs and Director(s) of the organisation are assigned this role. HR Manager – An ‘HR Manager’ role can access all employee information including employees’ profile details, attendance, leaves & salary/financial details. ‘HR Manager’ role will have restricted access to Settings, and can only make changes to Company Settings, Billing, Leaves & Holidays, Employee, Time & Attendance, Onboarding & Exit. HR Executive – An ‘HR Executive’ role has same access that an ‘HR Manager’ role has, except having access to salary/financial details of the employees. Payroll Admin – A ‘Payroll Admin’ will have access to all financial details of the organisation to effectively manage the payroll process of the organisation. Though, a ‘Payroll Admin’ will not have access to employees’ profile including employees’ leaves, time & attendance etc. Asset Manager – An ‘Asset Manager’ will have access to only asset related information of employees to effectively manage asset tracking & allocation. Project Admin – A ‘Project Admin’ will have all permissions across the Projects including Clients, Timesheet, Team, Tasks and Billing, Reports. 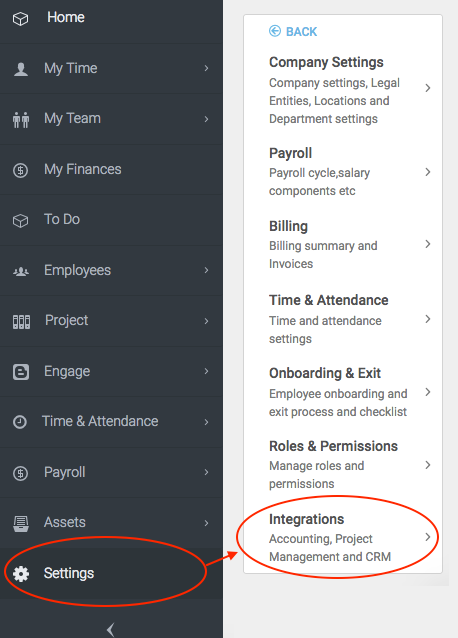 ‘Project Admin’ will not have any access related to employees’ profile including employees’ leaves, time & attendance, and payroll. Related: Can an employee have multiple roles assigned? Also can multiple employees have the same role? In case you are having trouble assigning roles, write to support@keka.com. Can an employee have multiple roles assigned? Also can multiple employees have the same role? Given any organisational structure, the number of roles an employee is playing can vary. For example, one employee is playing the role of HR manager as well as taking care of Payroll of employees in your organisation. It is also possible that if the size of company if big enough, there are multiple employee playing the same role, like, organisations having multiple HR managers, or multiple Payroll admins. 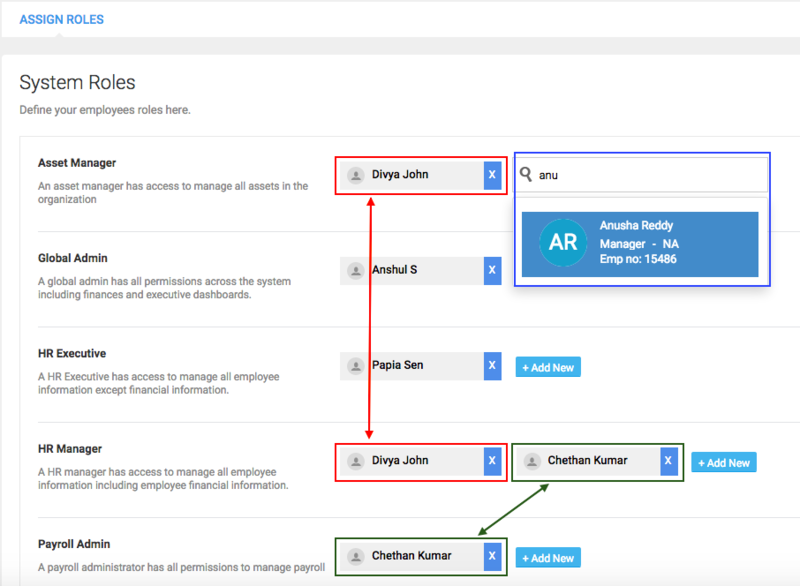 Keka gives you the flexibility to assign multiple roles to one employee, or assign multiple employees to one role, whatever the organisation’s structure demands. 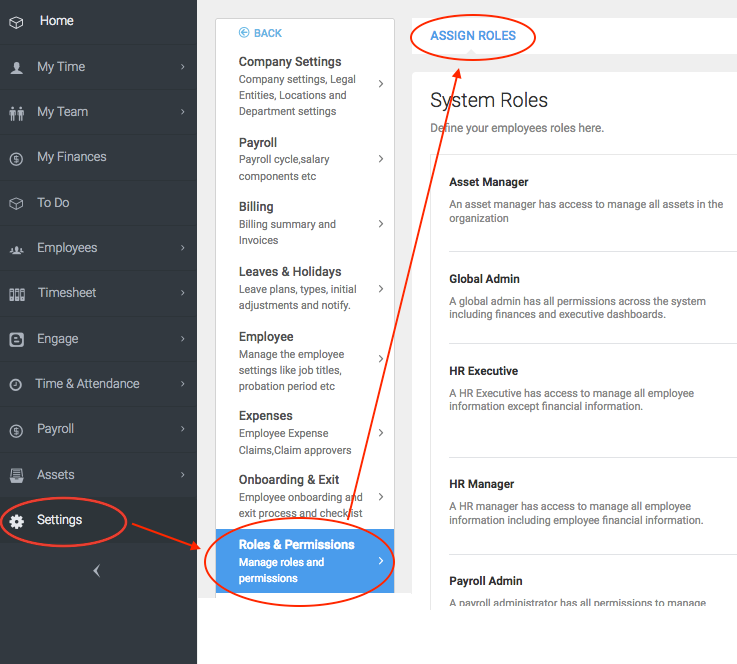 Step 2: Under Assign Roles, you can choose to assign single or multiple employees under each role. One employee can be assigned to multiple roles. 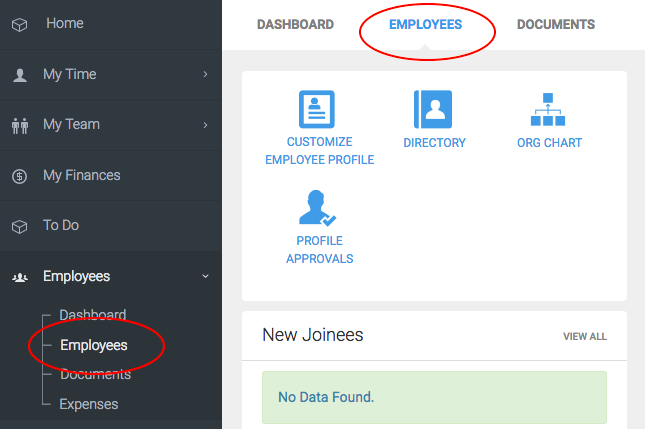 To start adding employee, click on ‘+ Add New’, type & select the name of employee you wish to assign to the role. IMPORTANT: Once the role has been assigned, the employee needs to Logout and Login again to get access to new roles & permissions. In case you are having trouble assigning roles & permissions to employees, write to support@keka.com. How do I restrict a current employee to login to Keka? Step 3: Confirm the disable login action by clicking on ‘Yes’ and the employee will no longer be able to access Keka. Note: This will not remove/exit the employee from your organization on Keka, but will only disable the employee’s login (thus restricting the employee to access Keka). In case you are not able to disable login of an employee, please write to support@keka.com. Why can’t I Login to Keka? It is possible that the email address you are using to login is not registered with Keka, or is incorrect. In case the email address is not registered, please follow the invitation link in your email to register on Keka before you can login. 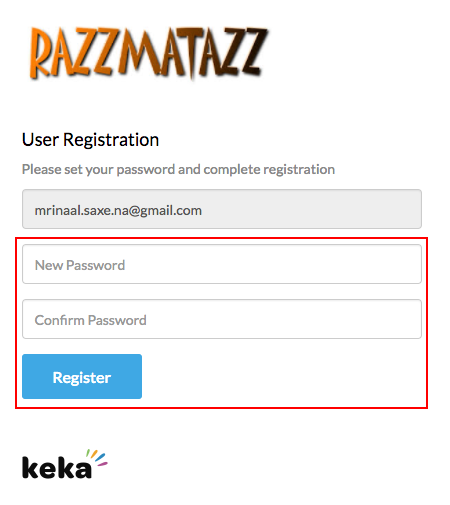 Related: How can an employee register on Keka? In case you are not sure about the correctness of email address that has been assigned against your account, please contact the HR of your organization. In case of incorrect email address, HR can correct the email address. The password you are using is not correct. Step 1: To rest your password, click on Forgot Password on the login screen. Step 2: On next screen, enter your email address that is registered with Keka, and click ‘Reset’ button. Step 3: You will receive an email with instructions on how to change your password. Click on the link in the email to reset your password and create a new one. Once done, you can use your registered email address and new password to login to your account. If any other user has accessed Keka earlier from the system (and same browser) you are using, there are chances that the old session still exists, which might be causing the issue. If you continue having trouble logging in to your account, it is suggested to clear the cookies & cache of your browser and try again. How to clear cookies/cache: Open the browser and press ‘Ctrl + Shift + Del‘. You will get an option to clear the history of the browser. Clearing the history will solve any issues you might be facing because of an existing session. You can alternatively use browser’s Incognito mode if you don’t want to clear the history. In case you are still not able to login to Keka, please write to support@keka.com. Can my employees Login to Keka using Office365 account? Yes. Employees can use their existing Office365 account to login to Keka. Before your employees can start using Office365 account to login to Keka, you are required to enable this option from the Settings. Step 2: You can see multiple login integration options available, including Office365 Single Sign-on. Click on ‘Change’ link to enable Office365 login option. Step 3: On the pop-up screen that appears, click on toggle button to Enable the Office365 Authentication. 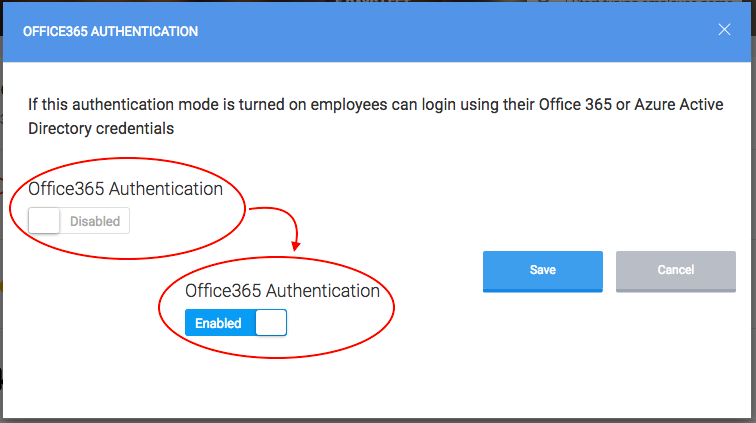 Once you have enabled Office365 authentication option, your employees will see ‘Login with Office 365’ button on the login screen as well, and they can use this to login to their account using their Office365 Account. 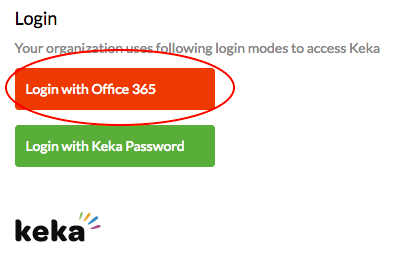 In case you are not able to enable ‘Office365 Sign-On’ for your organization, please write to support@keka.com. Can my employees Login to Keka using Google account? Yes. Employees can use their existing Google account to login to Keka. 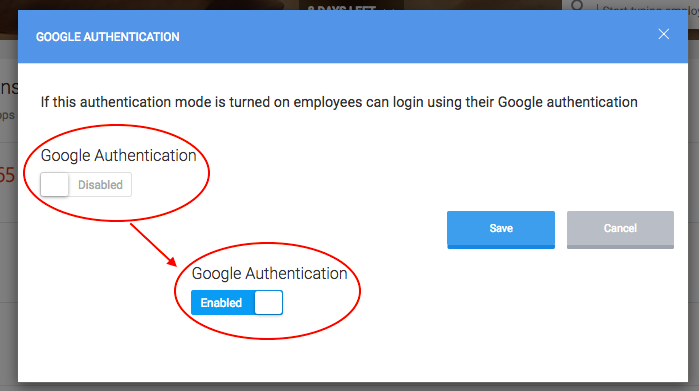 Before your employees can start using Google account to login to Keka, you are required to enable this option from the Settings. Step 2: You can see multiple login integration options available, including Google Single Sign-on. Click on ‘Change’ link to enable Google login option. Step 3: On the pop-up screen that appears, click on toggle button to Enable the Google Authentication. Once you have enabled Google authentication option, your employees will see ‘Login with Google’ button on the login screen as well, and they can use this to login to their account using their Google Account. 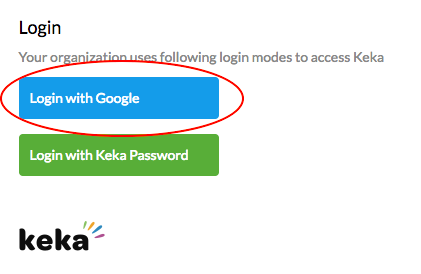 In case you are not able to enable ‘Google Sign-On’ for your organization, please write to support@keka.com. How can an employee register on Keka? Once the employee has been invited to Keka by the organization, an invitation email goes out to the employee. Related: How do I invite employees to join Keka? Step 1: Employee needs to login to the email account that has been registered with Keka. Employee will find an email from ‘Keka (donotreply@kekamail.com)‘ with subject line ‘You are invited by [Your Organization Name] with Keka Platform‘. Click on the ‘Accept Invitation’ button in this email to register. Note: If employee doesn’t see the invitation email in their Inbox, please check Junk/SPAM folder of the email. Add ‘donotreply@kekamail.com‘ to whitelist for receiving all future emails in the inbox. Step 3: Employee is now successfully registered with Keka. Employee can go ahead and complete the to-do tasks assigned by the HR. In case employee is not able to register, please write to support@keka.com. How do I remove an employee from my organization on Keka? IMPORTANT: Users’ profile on Keka CANNOT be deleted. In case you want to deactivate/remove an account from your organization’s account, please exit the employee as described below. Termination Triggered By – Select if the termination was due to employee action (Voluntary – Resignation, Absconding, Retirement, etc. ), or the employee was asked to leave, by the employer (Involuntary – Performance Issue, Misconduct, etc.). Select ‘Other’ if the reason is neither Voluntary, nor Involuntary (in case of Death, Medical Condition, etc.). Termination Reason – Select reason of termination from the options appearing in the dropdown. Regret Termination – Check this if you regret the termination of employee. Ok To Rehire – Check this if you are ok to again hire this employee in future. Termination Notification Date – When did the employee notify you about the resignation. Original Notice Period – Original notice period of the employee. This will be auto-populated (based on default settings for the employee) and can be changed. Adjusted Notice Period – In case there has been an adjustment/change in the notice period of the employee based on your discussion with the employee, you can update it here. This will automatically update the ‘Last Working Day’ of the employee. Last Working Day – In case you know the agreed last working day of the employee (as agreed upon), you can select the date. This will automatically update the adjusted notice period (if any). Notice Period Compensation – Choose if you want to compensate the employee for adjusted notice period. Payroll End Date – Specify the day on which payroll will end for the employee. Generally, the last working day of the employee is chosen to be the payroll end date as well. Notes – Any additional notes you would want to add against this employee for future reference. Click on ‘Continue’ and you will be directed to transfer role of the exiting employee, to any current employee of the organization. 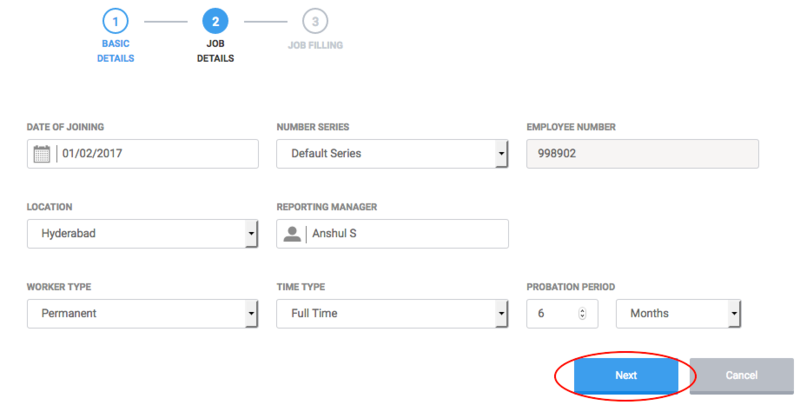 Step 4: On the next screen, you are required to assign a new reporting manager to the employees who were earlier reporting to the employee being exited. 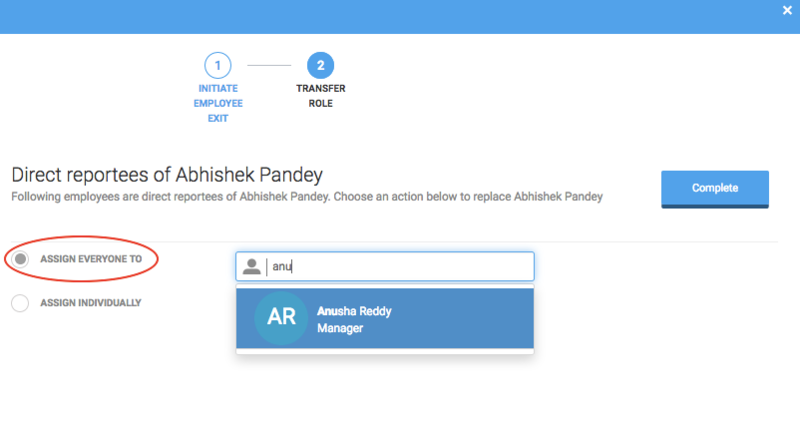 In the example above: All the employees who were earlier reporting to Abhishek Pandey, will now be assigned to Anusha Reddy for reporting. 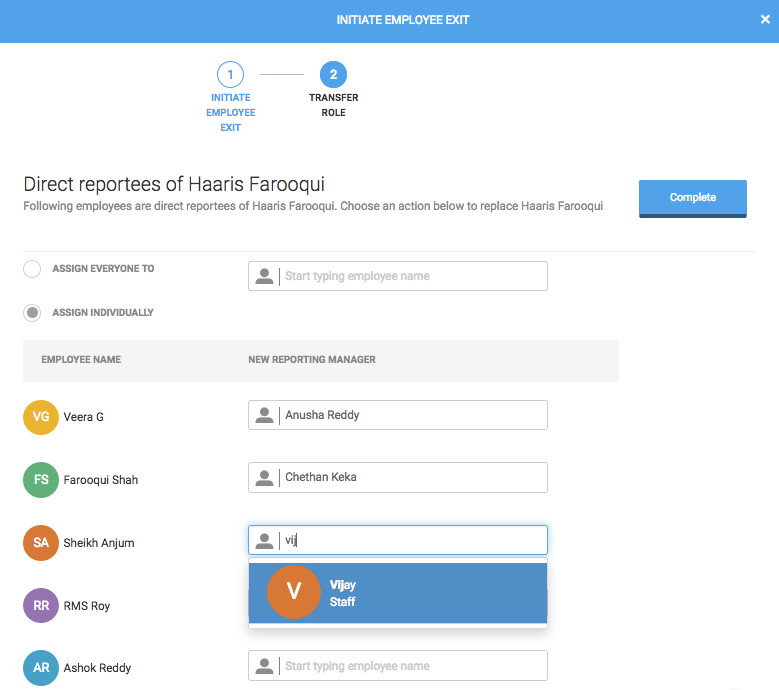 In the example above: All the employees who were earlier reporting to Haaris Farooqui, will now be assigned individually to new reporting managers. Veera will report to Anusha Reddy, Farooqui Shah will report to Chethan, and so on. 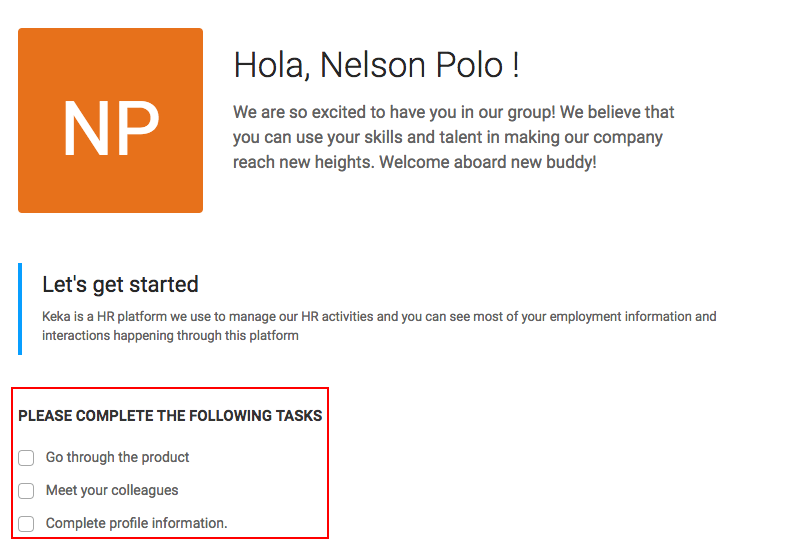 Once done assigning, click on ‘Complete’, and you have successfully exited the employee from your organization. In case you are not able to exit an employee, please write to support@keka.com. How do I add new employees on Keka? Step 4: Open the Excel file that you just downloaded. There are total of 43 employee information related columns, out of which 10 (marked in Red) are mandatory. Apart from the mandatory fields, it is recommended to fill in as many details as possible for the employee you are going to add. Important: The format for ‘Date of Birth’ and ‘Date of Joining’ should be ‘DD/MM/YYYY’ or ’12-FEB-2016′ (example). Please select ‘Gender’ and ‘Location’ from the dropdown that appears on cell selection. 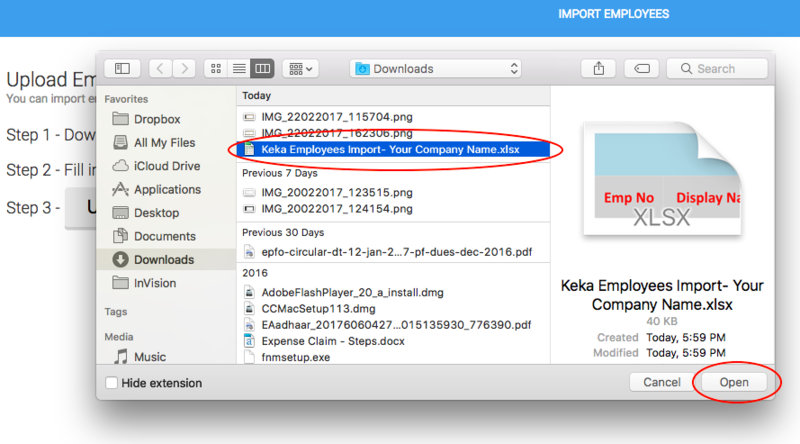 Step 5: Once you are done with adding the details of employees you want to add on Keka, save the file. Click on the ‘Upload Excel File’ button on the previous screen. Step 6: Select the file you just updated with employees’ details, and upload it to Keka system. Step 7: The next screen shows you if there are any duplicate emails that might have accidentally been assigned to multiple employees. In case, there are matching email addresses, click on ‘Cancel Import’ and update the excel file before uploading it again. 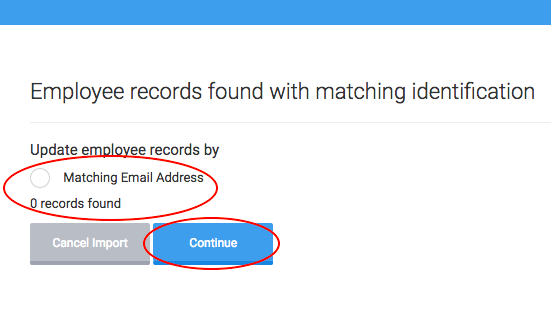 If there are no duplicate records, select ‘Matching Email Address’ radio button and click on ‘Continue’ to import the employees data. Step 8: You can review all the data that is being imported, on the next screen. Click on ‘Import’ once you are done with reviewing and validating the correctness of the data. You have successfully imported all the employees data to Keka. 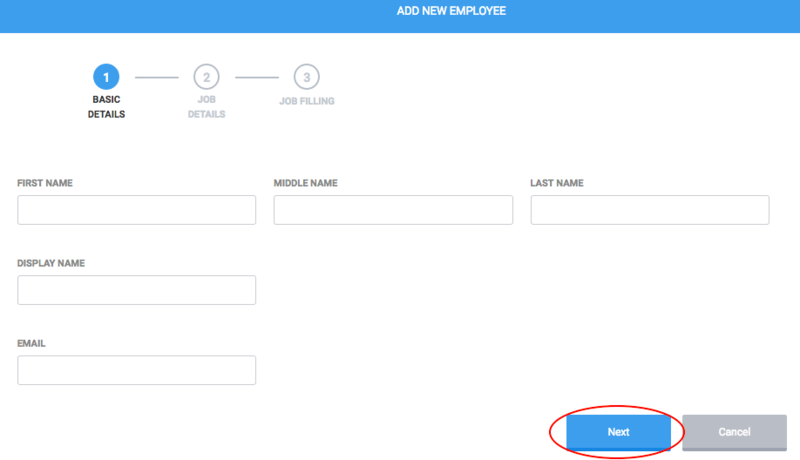 Step 2: On the subsequent screen you will be asked to add First Name, Middle Name (optional), Last Name, Display Name, and Email Address of the employee you are adding. 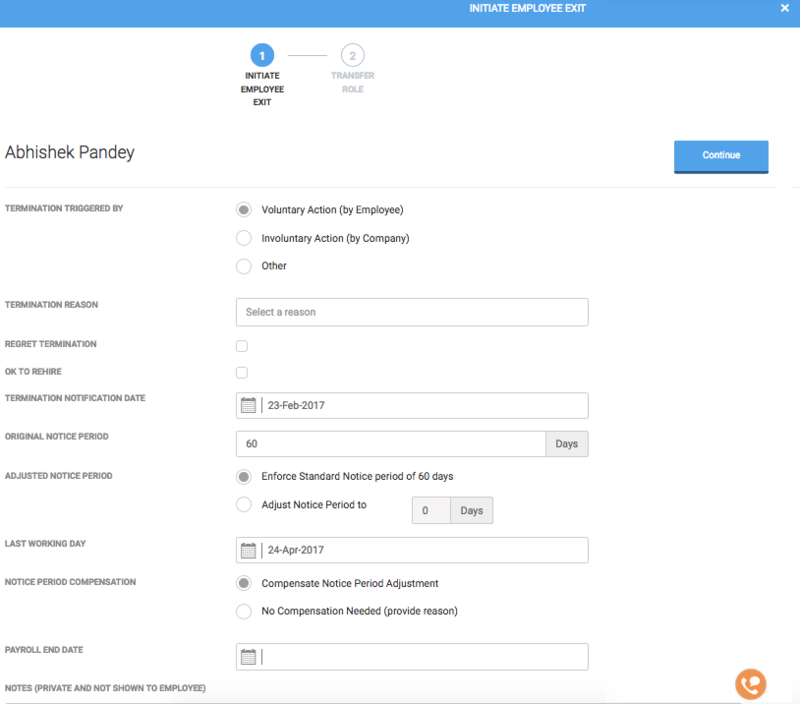 Once done adding click on ‘Next’ button to continue adding job details of the employee. Step 4: Assign/Update Leave plan, Shift, Week-off policy, Holiday list, Attendance tracking policy & Expense policy of the employee. All the fields are mandatory under this section of screen. 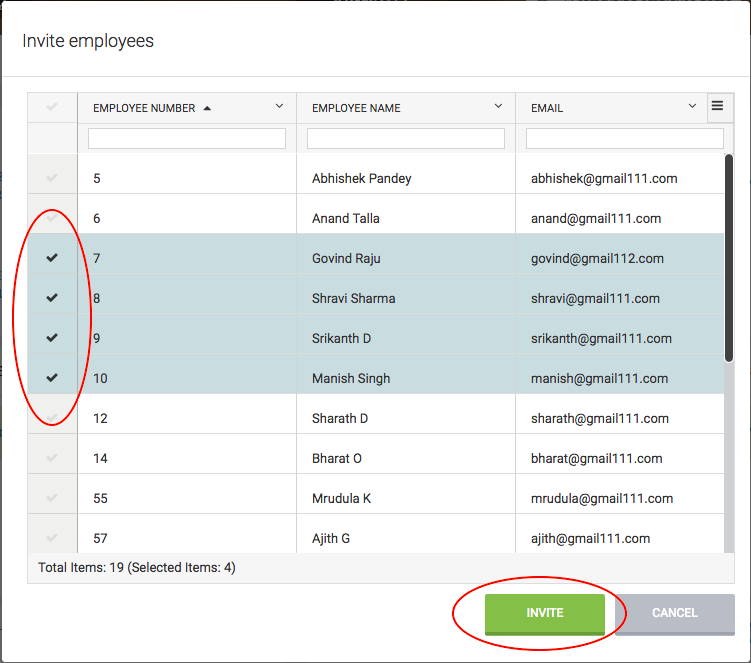 You can also choose to Invite employee instantly by using the checkbox before you click on ‘Save & Continue’. The employee has been added and invited to use the Keka system. In case you are not able to add employees, please write to support@keka.com. How do I invite employees to join Keka? All invited employees will receive an invitation link (from Keka) in their email to complete their registration. Sending invite to an employee who is already added to your Keka account, but is not invited yet. 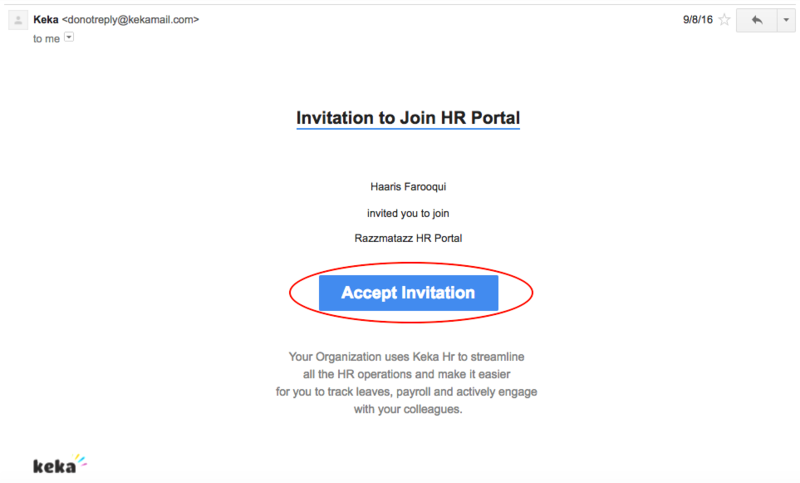 Step 3: Click on the Invite link and the employee will receive an invitation to join Keka. You can choose to re-invite employee in case the employee missed the invitation email for any reasons. In case you are not able to receive invitation emails, please write to support@keka.com. The Terms of Service Agreement (the “Agreement”) is made and entered into by and between you and Keka Technologies Private Limited (“Keka”), a company incorporated in India under the Companies Act, 1956. This Agreement contains the terms and conditions that govern the use of, and the terms and conditions upon which Keka will provide to you certain payroll, human resources and other related services through our website (collectively, the “Service”). The Agreement is applicable to all persons who use or access the Service, in their company’s capacity or on an individual capacity, including authorized users representing the employer, its employees or other persons using or accessing the Service (collectively, “Users”). If you are agreeing to these terms on behalf of a business, you represent and warrant that you have authority to bind that business to this Agreement, and your agreement to these terms will be treated as the agreement of the business. In that event, “you” and “your” refer to that business. What are the pricing models for Keka? What platform(s) is Keka available on? Keka is available on Web, iOS, and Android. Web App – You can access Keka by going to https://www.keka.com/ on the web browser. The recommended* browsers to access Keka are, Google Chrome and Mozilla Firefox (Latest versions). * When using Keka, we recommend using latest version of the recommended browser for seamless experience with Keka. iOS – Registered Keka users can also use Keka from their Apple iPhone. Download the Keka app from Apple Store and login using your Keka credentials to start accessing Keka on you iPhone. Android – Registered Keka users can also use Keka from theirAndroid Phones. Download the Keka app from Google Play Store and login using your Keka credentials to start accessing Keka on you Android Phone. Note: Keka is not available on Windows Phone and Blackberry. Why should I use Keka? 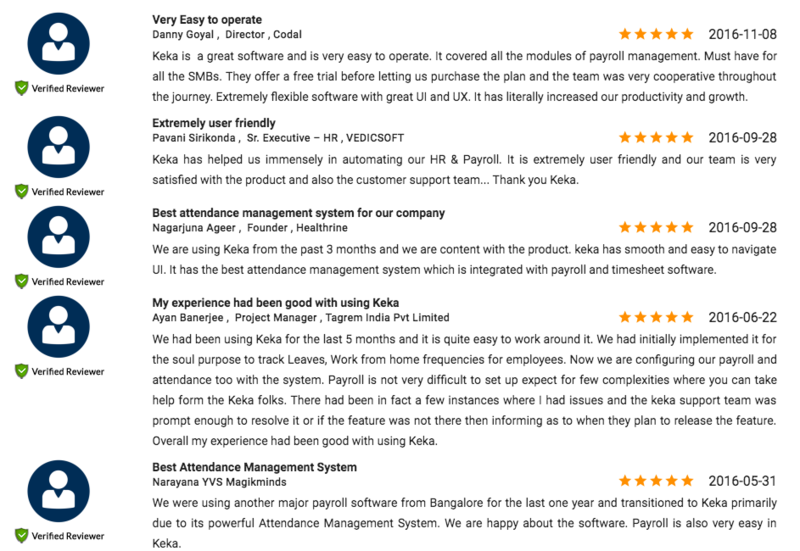 Unlike traditional HR systems, Keka is a modern new generation platform focused on user experience and simplifying complex workflows, with the help of great (and simple) UI backed my strong technology supporting it. Keka is a highly customizable platform and yet we have made the entire customization and setup process so easy that you can do it all by yourself. Most of the process on Keka are automated, and require minimal intervention from your side, including Attendance Tracking, Leave Management, Penalty on attendance irregularities, and Payroll run. The automation of tasks remove any scope of human error that can happen, and reduces the human effort involved in managing employees’ performance, attendance, payroll etc. Also, Keka’s support team is available round the clock to help with any queries or concerns, that the user might have. Copyright © Keka™ 2018. All rights reserved.